There are a lot of articles about Hibernate associations in the internet and particularly on my blog. But JPA provides numerous combinations of associations, so it’s not strange that we still see new posts about this or that kind of association. Today I want to examine situation with the @JoinTable annotation and intermediary table. For the tutorial I’ll use MySQL, Hibernate as implementation of JPA and Maven. Today’s example will be based on a simple situation – user role service. That means that I’m going to work with two entities: User, Role. Every user can has just one role. So in the database I need to create one table for the users, one table for the roles and the third one for the mapping of the roles to the users. The last table, as you understand, plays role of intermediary table. The admin record will be with the id = 1, and the moderator record will be with the id = 2. In this class you noticed that I applied a lot of annotations to the Role property. 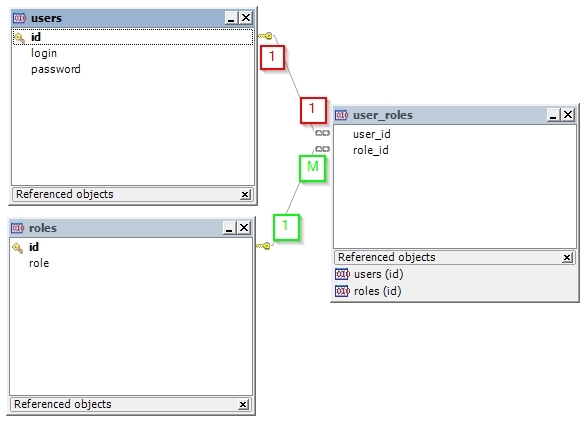 The @OneToOne annotation was used since users table is in “one to one” relationship with the user_roles table. The @JoinTable annotation indicates that we will interact with the intermediary table (user_roles) and further you can see settings of the relationship including mapping of columns. The joinColumns attribute is responsible for the columns mapping of the owning side. The name attribute contains the column name of the intermediary table, the referencedColumnName attribute contains the primary key column name (in our case the primary key column of the user table is id) of the owning side. The inverseJoinColumns attribute is responsible for the columns mapping of the inverse side. Here is everything is similar as in the explanation above, just with the one distinction – you need to apply this to the roles and user roles tables. More information about associations you can read in the one of my previous posts. In the Role entity, almost all annotations are the same as in the previous one. Pay your attention to @OneToMany annotation. Hence, appears property of collection type (private List userList). Hibernate: select role0_.id as id2_0_, role0_.role as role2_0_ from roles role0_ where role0_.id=? The @JoinTable annotation is a powerful feature of the Hibernate, it can be applicable to many situations to make your life easier. It can be used with two tables and with three, the last case I have demonstrated in this tutorial. You can find the sources of the application on my GitHub account.